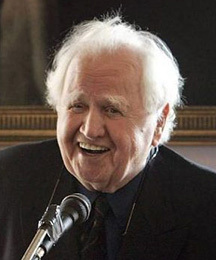 Born in Brooklyn, New York and raised in Limerick, Ireland from the age of three, Malachy McCourt returned to the land of his birth at age twenty and began his long-running career. He has appeared on and off Broadway in Mass Appeal, Da, The Hostage, Inherit the Wind, and A Couple of Blaguards, which he co-authored and starred in with his brother Frank. His TV credits include appearances on many soap operas and as a guest on The Tonight Show, Conan O’Brien and The Late, Late Show. His movie career has also been varied, with roles in The Molly Maguires, She’s The One, Devil’s Own, Green Card, and many others. As a writer, he has published a New York Times best selling memoir, A Monk Swimming, as well as a history of the song Danny Boy, a history of the Claddagh ring, and Malachy McCourt’s History of Ireland. Malachy also co-hosts the radio show “Talk Back” on WBAI 99.5 FM.